Analysis from Technavio, a UK-based technology-research company, forecasts the global waterjet-machine market to grow at a compound annual growth rate of 9.3 percent from 2013 to 2018. 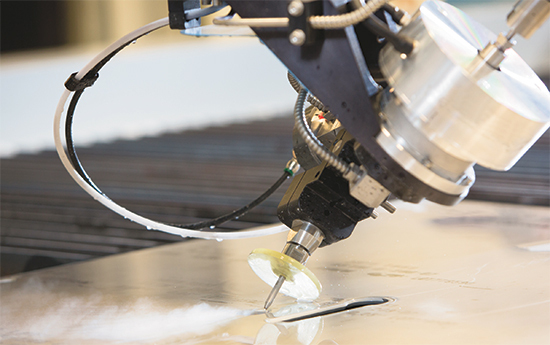 The flexibility afforded by the waterjet-cutting process fits right in with the goals of metal fabricators, to achieve lean manufacturing and use innovative technologies to develop unique products. According to the recently released FMA 2014 Capital Spending Forecast, which projects spending among 30 categories of equipment, waterjet-cutting ranks 10th, just above ironworkers and just below tube- and pipe-bending equipment. Of the $2.2 billion of projected spending accounted for in the report, waterjet cutting represents $68 million, or 3 percent of the total. • There is a push toward smaller, more precise and more affordable machines. • Machines will be made by more manufacturers, mostly system integrators who purchase components and assemble them in some new . • As fabricators continue to learn and understand the capabilities of the waterjet-cutting process, more of them will add the process to their resume. • Refined machine designs and improved part quality will reduce the amount of maintenance required to keep waterjet-cutting machines operating, and make them easier to work on. • Precision and speed will continue to improve—“by 2015, the machines of the early 1990s will seem quaint and crude,” the article notes. • The shift from older intensifier pumps to more efficient and faster-cutting direct-drive pumps will continue. • Predicted is the eventual development of an affordable long-lasting mixing tube. • Versatility—Waterjet cutting can be used to machine reflective materials such as copper and aluminum as well as heat-sensitive materials. The machines also require little to no setup changes when switching from cutting thin to thick materials. • No heat-affected zone (HAZ)—Waterjet cutting does not heat the material nor change its properties, so there is no HAZ and no thermal distortion occurs. • Environmentally friendly—Abrasive waterjet systems use garnet, which is a non-reactive biologically inert mineral. • Safe—Waterjets do not heat or melt the workpiece material, so they produce no noxious fumes nor pose a risk of fire. • Tight tolerances—On thinner parts, waterjet-cutting machines and lasers offer comparable tolerances, but on parts thicker than 0.5 in., waterjet cutting typically yields tighter tolerances. • Can machine thicker materials—Shops can waterjet-cut materials to 3 in. thick (or more), while most lasers have a maximum practical cutting thickness of 0.75 in. • Good edge finish—Waterjet-cut parts typically exhibit fine, sand-blasted surfaces because of the the material is abraded. Let’s go shopping for some new waterjet-cutting technology. 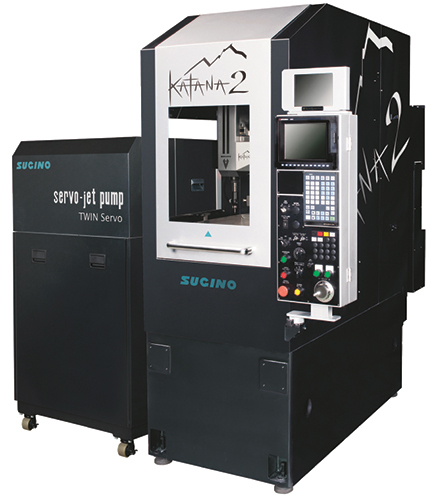 Sugino Corp., Itasca, IL, introduces the Katana2 ultrahigh-pressure waterjet-cutting machine, ideally suited for cutting titanium, stainless steel, carbon-fiber reinforced polymers (CFRPs) and other hard materials such as copper and glass. Utilizing Sugino’s newly developed extra-fine abrasive nozzle (0.3- to 1.5-mm dia. ), the Katana2 can achieve cutting diameters as low as 0.012 in. at pressures as high as 43,500 PSI. With a footprint of only 57 by 81 in., the Katana2 also is eco-friendly, promising to minimize the consumption of abrasive materials and power. Cutting area: 9.5-in. x axis, and 8-in. y and z axes. 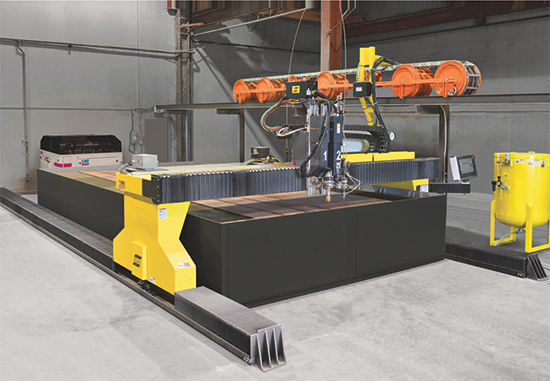 Esab Cutting Systems, Florence, SC, introduces the Hydrocut LX shapecutting machine, combining waterjet and plasma systems operating on the same gantry. Fabricators can cut precision contours with the waterjet, and noncritical contours with plasma. The machine boasts a heavy-duty gantry with a high-stiffness beam design featuring dual precision linear rails and rack-and-pinion drives. Equip it with as many as four waterjet stations and two high-definition plasma stations (Esab’s m3 Precision Plasmarc). Powering its waterjet action is a KMT 90,000-PSI pump. At the helm: Esab’s Vision T5 control and Columbus III CAD/CAM programming and nesting software, designed specifically for plasma, oxyfuel, laser and waterjet cutting. The software handles simple to highly complex cuts, multiprocess cuts, labeling and nesting jobs. Using new Intelli-Cam advanced computer-aided manufacturing software from Omax Corp., Kent, WA, engineers can generate 2D and 3D waterjet-cutting tool paths from 3D models. Import a 3D file in one of the many supported file types and the 3D object appears in an interactive window; generating a 2D profile from any face or slice is just a click a. 3D pathing is just as easy, with the AutoPath function creating the tool path and applying the required attributes for 3D cutting before exporting. • Offers single-click export to an Omax CAD file or open direct into Omax Intelli-Max Layout or Make. Bystronic, Elgin, IL, introduced FABTECH visitors to its ByVision Control programming interface, boasting a full 15-in. touchscreen that allows users of waterjet- and laser-cutting machines to quickly maneuver through screen selections for efficient setup and operation. The ByVision user interface operates within a Windows XP professional platform for speed and network compatibility. The firm’s popular Bysoft CAD/CAM software has a new addition: the Plant Manager Cutting (PMC) module. It finds use for fact-based planning and monitoring of all waterjet- and laser-cutting processes. 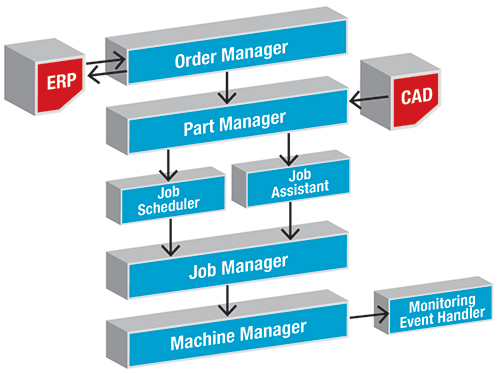 The PMC automatically processes order and CAD data independent of any programmer intervention, eliminating the time required for cutting-plan preparation and feedback to the production-planning system. Managers gain access to critical decision-making data including load balancing of each machine, order volume and status, and expected completion and due dates. 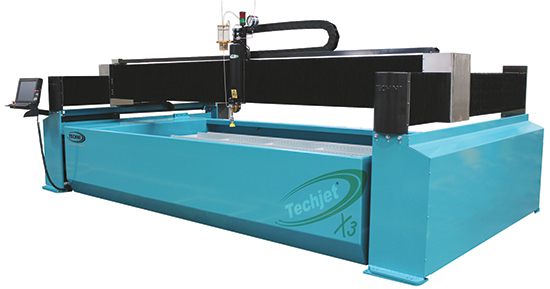 Techni Waterjet, Lenexa, KS, recently debuted its Quantum NXT electric servo pump and its TJ4100-G-X3 gantry-style waterjet-cutting machine (below). The Quantum, explained company officials at FABTECH 2013 in Chicago, employs a servo motor directly enveloping a high-load precision ball screw that houses the ceramic plungers. Pumping action results from the reciprocating plungers. The TJ4100-G incorporates linear-scale feedback. By mapping the entire cutting area with a laser-calibrated digital encoder, the motion system is rated to a positional accuracy of 0.0005 in. ; cutting speed tops out at 1000 in./min. Also on display at FABTECH: a rotary axis that employs a direct-drive motor assembly capable of accurately (±0.1 deg.) positioning and contouring a workpiece under the cutting stream. 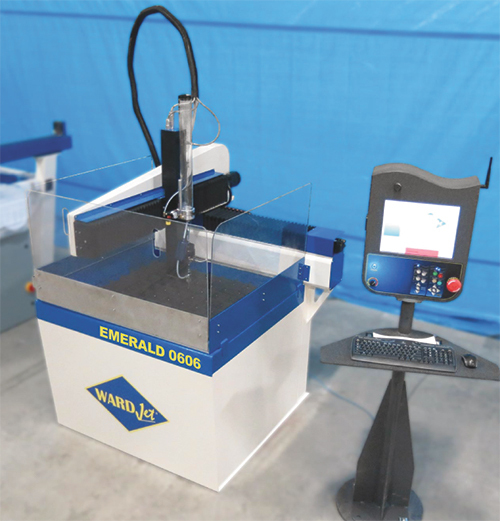 WardJet, Tallmadge, OH, introduces the Emerald 0606 (below) (2 by 2 ft.) and the Emerald 0612 (2 by 4 ft.) waterjet-cutting machines to its existing Emerald series. The smallest waterjet ever manufactured by WardJet, the Emerald 0606 reportedly offers the quality of a large, expensive waterjet-cutting system at a reduced size and cost. Because of its rigid, sturdy tank design, the Emerald 0606 can cut 12-in. stainless steel just as easily as a 2-in. sheet of foam. The Emerald 0606 offers 12 in. 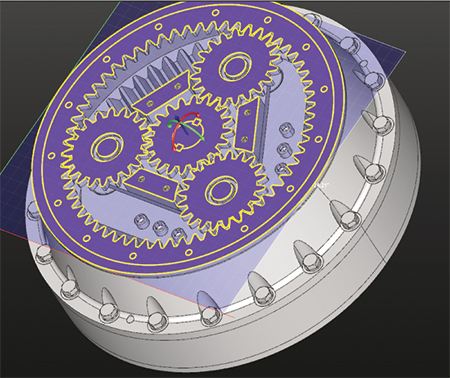 of Z-axis travel, and features ballscrew drives and a cantilever-style arm. This short-travel, cantilever architecture effectively balances the reduced machine footprint, say company officials, and minimizes the number of moving parts while maximizing cutting envelope and maintaining overall stiffness. The Emerald 0612 offers double the cutting envelope of the Emerald 0606. The cantilever-style arm is ballscrew-driven and the tank is beefed up for extra support. It can index sheets of unlimited length from front to back, while standard 4- by 8-ft. sheets of material up to 2 in. thick can be cut with greater convenience. At FABTECH, Flow International, Kent, WA, showcased its Dynamic Waterjet taper-compensation feature that it most recently made available (in May 2013) on its Mach 2c, which it calls an “affordable waterjet system.” Dynamic Waterjet previously was only available on Flow’s advanced Mach 3 and Mach 4 waterjet systems. Dynamic Waterjet produces faster, more accurate parts by adjusting taper angle in concert with cutting speed. The feature avoids the stream lag and taper inherent with all waterjet-cutting machines, previously only minimized by reducing cutting speed. Dynamic Waterjet (with Flow’s Active Tolerance Control) counters taper and stream lag using Flow’s SmartStream mathematical models. More than just a tilting cutting head, SmartStream technology changes the angle dynamically based on cutting speed. The precision motion system can attain travel speeds to 800 in./min. Early in 2013, Hypertherm (Hanover, NH) announced its acquisition of waterjet-equipment manufacturer Accu-Stream. 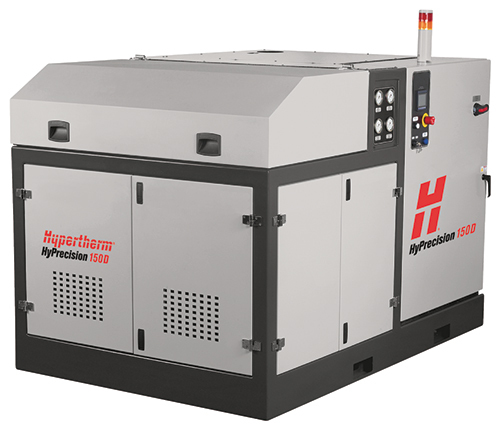 FABTECH 2013 marked Hypertherm’s display of the AccuStream of HyPrecision line of waterjet-cutting pumps, rated from 15 to 150 hp. Advanced intensifier technology, company officials explained to showgoers, promises to extend maintenance intervals, reduce maintenance time and optimize performance. Additionally, high pump reliability (large-diameter ceramic plunger to prolong seal life, among other features) reportedly drives down the total cost of ownership by as much as 20 percent when compared to competitive systems. Eight machine models fill out the line, including the most powerful model, HyPrecision 150D. Features include soft start capability, color-touchscreen user interface, remote operation and monitoring through Modbus TCP, and proportional pressure control. Waterjet-system manufacturer Jet Edge, Inc., St. Michael, MN, introduces the Edge X-5 five-axis waterjet system that cuts complex, taper-free and 3D parts from virtually any material. Featuring the firm’s Permalign Edge technology, the machine can cut chamfers, weld bevels and sophisticated 3D parts such as impeller blades. The Edge X-5 features an industrial PC controller designed specifically for five-axis waterjet cutting. The AquaVision Di Controller’s open-architecture design gives operators the freedom to fine-tune programs from any CAD/CAM/nesting software, using standard G&M CNC code. Its Intelligent Work Envelope automatically adjusts depending on the angle of the cut to protect the operator, material and system components. The Edge X-5, ballscrew-driven for optimal precision, features direct-couple AC brushless digital servo motors, single or double carriages, and cutting-table size from 5 by 5 to 24 by 13 ft. Also noteworthy from Jet Edge was the introduction, at FABTECH 2013, of its low-cost 40- by 40-in. table, available in three configurations, all with direct-drive pumps. 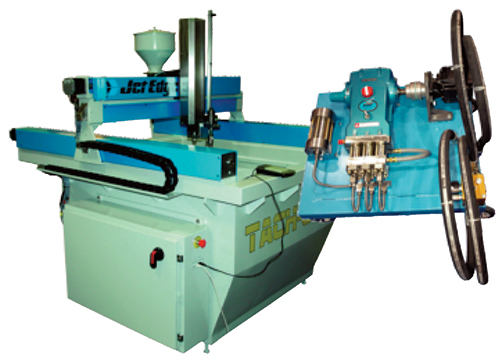 Included is the Tach-Jet model (shown); its pump uses a tractor or skid-steer’s hydraulic circuit. See also: Bystronic Inc., ESAB Welding & Cutting, Flow International Corp., Hypertherm, Inc., Jet Edge Waterjet Systems, Omax Corporation, Techni Waterjet, WardJet, Inc., Sugino Corp.
Way cool, some valid points! I appreciate you making this article available, the rest of the site is also high quality. Have a enjoyable.